Anke Ebener brings a great depth of knowledge to the practice of Equine Interactive Psychotherapy and Learning. She has been riding and caring for horses since she was five years old, and together with her husband, she maintains a herd and has raised and trained race horses for the past 15 years. During puberty, Anke struggled with anorexia. Horses played an essential role in her recovery. 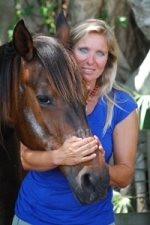 Anke holds a Bachelors Degree in Equine Science and she has been trained in Applied Behavior Analysis. (A.B.A.) She is an certified and insured horse trainer and is an certified Equine Specialist through EAGALA (Equine Assisted Growth and Learning Association). She is the founder of the Children's Foundation for Equine Assisted Therapy, Inc.,a 501(c)3 charity in Boca Raton, which provides equine assisted Therapy for children with developmental disabilities. As the program director of Horse Sense, Anke will work with your choice of professionals or an qualified mental health professionl will be recommended by Horse Sense.